For other people named Szigeti, see Szigeti (surname). Joseph Szigeti (Hungarian: Szigeti József, [ˈjoːʒɛf ˈsiɡɛti]; 5 September 1892 – 19 February 1973) was a Hungarian violinist. From the 1920s until 1960, Szigeti performed regularly around the world and recorded extensively. He also distinguished himself as a strong advocate of new music, and was the dedicatee of many new works by contemporary composers. Among the more notable pieces written for him are Ernest Bloch's Violin Concerto, Bartók's Rhapsody No. 1, and Eugène Ysaÿe's Solo Sonata No. 1. After retiring from the concert stage in 1960, he worked at teaching and writing until his death in 1973, at the age of 80. Szigeti was born Joseph "Jóska" Singer to a Jewish family in Budapest, Austria-Hungary. His mother died when he was three years old, and soon thereafter the boy was sent to live with his grandparents in the little Carpathian town of Máramaros-Sziget (hence the name Szigeti). He grew up surrounded by music, as the town band was composed almost entirely of his uncles. After a few informal lessons on the cimbalom from his aunt, he received his first lessons on the violin from his Uncle Bernat at the age of six. Szigeti quickly showed a talent for the violin. Several years later, his father took him to Budapest to receive proper training at the conservatory. After a brief stint with an inadequate teacher, Szigeti auditioned at the Franz Liszt Academy of Music and was admitted directly into the class of Jenő Hubay, without the usual delays and formalities. Hubay, who had been a student of Joseph Joachim in Berlin, had by that time established himself as one of the preeminent teachers in Europe and a fountainhead of the Hungarian violin tradition. Szigeti joined such violinists as Franz von Vecsey, Emil Telmányi, Jelly d'Arányi and Stefi Geyer in Hubay's studio. The young Szigeti. Recorded 1908. In those days, Europe produced a great many child prodigies, inspired by the phenomenal success of the young Czech virtuoso Jan Kubelík and formed by rigorous teaching and enthusiastic parents. The Hubay studio was no exception; Szigeti and his fellow wunderkinder performed extensively in special recitals and salon concerts during their study at the Liszt Academy. In 1905, at the age of thirteen, Szigeti made his Berlin debut playing Bach's Chaconne in D minor, Ernst's Concerto in F-sharp minor, and Paganini's Witches Dance. Despite the formidable program, the event received mention only by a photograph in the Sunday supplement of the Berliner Tageblatt captioned: "A Musical Prodigy: Josef Szigeti". Szigeti spent the next few months with a summer theater company in a small Hungarian resort town, playing mini-recitals in between acts of folk operetta. In that same vein, the next year he played at a circus in Frankfurt, where he appeared under the pseudonym "Jóska Szulagi". Also in 1906, Hubay took Szigeti to play for Joseph Joachim in Berlin. Joachim was impressed, and suggested that Szigeti should finish his studies with him. Szigeti declined the offer, both out of loyalty to Hubay and a perceived aloofness and lack of rapport between Joachim and his students. Soon after the meeting with Joachim, Szigeti embarked on a major concert tour of England. Midway through the tour, in Surrey, he met a music-loving couple who effectively adopted him, extending an invitation to stay with them for an indefinite length of time. Throughout England, he gave many successful concerts, including the premiere of the first work dedicated to him: Hamilton Harty's Violin Concerto. Also during this time, Szigeti toured with an all-star ensemble including legendary singer Dame Nellie Melba and pianists Ferruccio Busoni and Wilhelm Backhaus. Philippe Gaubert, a famous French flutist of the day, as well as the young singer John McCormack, were also part of these tours. The most significant of the new contacts was Busoni. The great pianist and composer became Szigeti's mentor during these formative years, and the two would remain close friends until Busoni's death in 1924. By Szigeti's own admission, before meeting Busoni his life was characterized by a certain laziness and indifference brought on by the then-typical life of a young prodigy violinist. He had grown accustomed to playing crowd-pleasing salon miniatures and dazzling virtuosic encores without much thought. He knew little of the works of the great masters; he could play them, but not fully understand them. As Szigeti put it, Busoni—particularly through their careful study of Bach's Chaconne—"shook me once and for all out of my adolescent complacency". In 1913, Szigeti was diagnosed with tuberculosis and was sent to a sanatorium in Davos, Switzerland to recover, interrupting his concert career. During his stay at the sanatorium, he became re-acquainted with the composer Béla Bartók, who was recovering from pneumonia. The two had known each other only in passing during their conservatory days, but now they began a friendship that would last until Bartók's death in 1945. In 1917, having by then made a full recovery, at age 25 Szigeti was appointed Professor of Violin at the Geneva Conservatory of Music. Szigeti said that this job, although generally satisfying, was often frustrating due to the mediocre quality of many of his students. The years teaching in Geneva provided an opportunity for Szigeti to deepen his understanding of music as an art, along with other aspects such as chamber music, orchestral performance, music theory and composition. Also during that time, Szigeti met and fell in love with Wanda Ostrowska, a young woman of Russian parentage who had been stranded in Geneva by the Russian Revolution of 1917. They married in 1919. With Hamilton Harty conducting the Halle Orchestra. Recorded 1928. By 1930, Szigeti was established as a major international concert violinist. He performed extensively in Europe, the United States and Asia, and made the acquaintance of many of the era's leading instrumentalists, conductors and composers. During the 1930s, 1940s and into the 1950s, Szigeti recorded extensively, leaving a significant legacy. Notable recordings include the above-mentioned Library of Congress sonata recital; the studio recording of Bartók's Contrasts with Benny Goodman on clarinet and the composer at the piano; the violin concertos of Beethoven, Brahms, Mendelssohn, Prokofiev (No. 1) and Bloch under the batons of such conductors as Bruno Walter, Hamilton Harty and Sir Thomas Beecham; and various works by J.S. Bach, Busoni, Corelli, Handel and Mozart. One of his last recordings was of the Six Sonatas and Partitas for solo violin by Bach; although his technique had deteriorated noticeably by that time, the recording is prized for Szigeti's insight and depth of interpretation. In 1950, Szigeti was detained at Ellis Island upon returning from a European concert tour and was held for several days, officially "temporarily excluded" from the country. The reasons for his detention remain unclear. The following year, he became a naturalized American citizen. During the 1950s, Szigeti began to develop arthritis in his hands and his playing deteriorated. Despite his weakened technical mastery, his intellect and musical expression were still strong, and he continued to draw large audiences to his concerts. In Naples, Italy, in November 1956, just after the Soviets crushed the Hungarian uprising, as soon as he walked onto the stage the audience burst into wild applause and shouts of Viva l’Ungheria! (Italian for "Long live Hungary! "), delaying the concert for nearly fifteen minutes. In 1960 Szigeti officially retired from performing, and returned to Switzerland with his wife. There he devoted himself primarily to teaching, although he still traveled regularly to judge international violin competitions. Top-class students from all over Europe and the United States came to study under him. One of these students was Arnold Steinhardt, who spent the summer of 1962 with Szigeti. He came to the conclusion that "Joseph Szigeti was a template for the musician I would like to become: inquisitive, innovative, sensitive, feeling, informed". We must be humbly grateful that the breed of cultured and chivalrous violin virtuosos, aristocrats as human beings and as musicians, has survived into our hostile age in the person of Joseph Szigeti. Let us not, if we can avoid it, fall victim to the dead letter of the law. I don't want to postpone the happiness of these two youngsters if we can help it. All laws have been twisted and tortured out of semblance of law, what with war and revolutions. For once let's twist and turn one for a good cause, yes? Just before the birth of their only child, daughter Irene, Szigeti found himself stuck in Berlin during the Kapp Putsch of 1920, unable to return to Geneva. The entire city had been paralyzed by a general strike, and the trains were not running. His scheduled concert could not go on as planned, but he was forced to stay in Berlin for "interminable days" while the Putsch ran its course. Szigeti writes: "... the impossibility of communicating by phone or wire with my wife--whose condition I pictured with the somewhat lurid pessimism usual to young prospective fathers--was certainly a greater torment to me than all the other discomforts put together". Wanda is happy, doing wonders with her gardening, chicken and rabbit raising, preserve and pâté de foie making. She doesn't budge from our place, doesn't want to come back to New York even for a visit, which I, for one, can well understand! Two dogs, an aviary full of exotic birds, tomatoes, grapes, strawberries, asparagus, artichokes, lovely flowers (camellias too! ), right in our own little world. Szigeti narrowly escaped being killed in the plane crash that claimed the life of movie star Carole Lombard in January 1942. Szigeti, who was on his way to Los Angeles for a concert, was forced to give up his seat on TWA Flight 3 at a refueling stop in Albuquerque, NM to allow the plane to take on 15 soldiers who, it being wartime, had priority. The plane, off course at night and with wartime blackout conditions in effect, crashed into a mountain cliff after take off from an intermediate stop in Las Vegas, killing everyone on board. In 1960, the couple returned to Europe and settled near Lake Geneva in Switzerland, close to the home of their daughter and son-in-law. They remained there for the rest of their lives. Wanda died in 1971, predeceasing her husband by two years. Szigeti's performing technique was not always flawless and his tone lacked sensuous beauty, although it acquired a spiritual quality in moments of inspiration ... Szigeti held the bow in an old-fashioned way, with the elbow close to the body, and produced much emphatic power, but not without extraneous sounds. Minor reservations, however, were swept aside by the force of his musical personality. ... his performance was stiff and dry in its observance of letter and its absence of spirit ... Mr. Szigeti was not only inclined to dryness of tone and angularity of phrase, but there were also passages of poor intonation. Mr. Szigeti has a rather small but beautiful tone, elegance, finish. He played with a quiet sincerity which grew upon the audience, though not with the virility and sweep that other violinists find ... it is clear that Mr. Szigeti is a player to command esteem and respect for his musicianship, for the genuineness of his interpretations, and his artistic style. Szigeti... was an incredibly cultured musician. Actually his talent grew out of his culture ... I always admired him, and he was respected by musicians ... in his late years, he finally got the appreciation he deserved from the general public as well. Szigeti was one of the giants among the violinists I had heard from childhood on, and my admiration for him is undiminished up to this day. "He invited me to his recital in Town Hall ... the first few minutes were excruciating: as I saw later, his fingers had deteriorated to the point that he had almost no flesh on them. But once he loosened up a bit he produced heart-rending beauty. Apart from Enesco, he was the most cultivated violinist I have ever known but while Enesco was a force of nature, Szigeti, slender, small, anxious, was a beautifully fashioned piece of porcelain, a priceless Sèvres vase. Curiously for a Hungarian, from whom one expects wild, energetic, spontaneous qualities, Szigeti travelled even farther up a one-way road of deliberate intellectualism. A young accompanist who worked with Szigeti told me that two hours concentration wouldn't get them beyond the first three bars of a sonata--so much analysis and ratiocination went into his practice ... A similar persnicketiness marked his adjudication. Shortly before he died in 1973, he was a member of our jury at the City of London Carl Flesch Concours ... I was struck not only by the sharpness of his intellect but also by what seemed to me the perversity of his opinions. Some particular aspect of a competitor's playing would hold his attention, and he would take violent issue with it, to the exclusion of everything else. For him a violinist was made or broken, a prize awarded or withheld, on details that to me scarcely mattered. Nevertheless, Menuhin too referred to Szigeti as "a violinist whom I much admired and a man of whom I was very fond". During his time in America, Szigeti took to writing; his memoirs, With Strings Attached: Reminiscences and Reflections were published in 1947. The New York Times reviewed it favorably: although in their description the book was "constructed along utterly anarchistic lines, with each episode and anecdote left pretty much on its own", they asserted that "It also has the flavor of life in it, and it is marked by an exhilarating revolt against the custom of arranging catastrophes and triumphs under neat chapter headings". In 1969, he published his treatise on violin playing, Szigeti on the Violin. In it Szigeti presents his opinions about the then-current state of violin playing and the various challenges and issues facing musicians in the modern world, as well as a detailed examination of violin technique as he understood it. A recurring theme in the first part is the changing nature of violinist's lives during Szigeti's later years. In his youth, concert artists relied primarily on recitals to establish themselves and attract critical attention and acclaim; by the time of Szigeti's writings, the recital had been eclipsed in importance by the competition. Szigeti was dismayed by this trend, especially since he considered the fast-paced and intense preparation necessary for high-level competitions to be "…incompatible with the slow maturing either of the performing artist or of the repertoire." Szigeti believed that such accelerated development of a musician led to performances that "lack(ed) the stamp of authenticity, the mark of a personal view evolved through trial and error." In a similar vein, he was skeptical of the effects produced by the recording industry on the culture of music-making. In Szigeti's opinion, the allure of the recording contract and the instant "success" that it implied led many young artists to record works before they were musically ready, and thus contributed to the problem of artificially fast development and resulting musical immaturity. Szigeti also offers a lengthy and detailed explanation of his approach to violin technique. He believed that a violinist should be concerned primarily with musical goals, rather than simply choosing either the easiest or most impressively virtuosic way to play a certain passage. He was particularly concerned with tone color: he advised that "The player should cultivate a seismograph-like sensitivity to brusque changes of tone colour caused by fingerings based on expediency and comfort rather than the composer’s manifest or probable intentions." Other topics prominently discussed include the most effective position of a violinist's left hand, the violin works of Béla Bartók, a cautionary list of widely accepted misprints and editorial inaccuracies in the standard repertoire, and most notably, the vital importance of J.S. Bach's Six Sonatas and Partitas for any violinist's technical and artistic development. Excerpt from Szigeti's arrangement of Béla Bartók's Hungarian Folk Songs. With Béla Bartók, piano. Recorded 1930. Szigeti was an avid champion of new music, and frequently planned his recitals to include new or little-known works alongside the classics. Many composers wrote new works for him, notably Béla Bartók, Ernest Bloch, and Eugène Ysaÿe, along with lesser-known composers such as David Diamond and Hamilton Harty. Modern composers realize that when Szigeti plays their music, their inmost fancy, their slightest intentions become fully realized, and their music is not exploited for the glorification of the artist and his technique, but that artist and technique become the humble servant of the music. Szigeti was also the dedicatee of the first of Eugène Ysaÿe's Six Sonatas for Solo Violin; in fact, Ysaÿe's inspiration to compose the sonatas came from hearing Szigeti's performances of J.S. Bach's Six Sonatas and Partitas, to which they are intended as a modern counterpart. Perhaps Szigeti's most fruitful musical partnership was with his friend Béla Bartók. 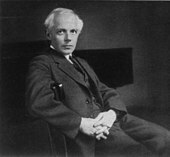 The first piece Bartók dedicated to him was the First Rhapsody for violin and orchestra (or piano) of 1928; the rhapsody, based on both Romanian and Hungarian folk tunes, was one of a pair of violin rhapsodies written in 1928 (the other being dedicated to Zoltán Székely.) In 1938, Szigeti and clarinetist Benny Goodman teamed up to commission a trio from Bartók: originally intended to be a short work just long enough to fill both sides of a 78 rpm record, the piece soon expanded beyond its modest intent and became the three-movement Contrasts for piano, violin and clarinet. In 1944, by which time Szigeti and Bartók had both fled to the United States to escape the war in Europe, Bartók's health was failing and he had sunk into depression. He was in dire need of money, but felt no inspiration to compose and was convinced that his works would never sell to an American audience. Szigeti came to his friend's aid by securing donations from the American Society of Composers and Publishers to pay for Bartók's medical treatment, and then, together with conductor and compatriot Fritz Reiner, persuaded Serge Koussevitzky to commission from Bartók what eventually became his much-beloved Concerto for Orchestra. The work's success brought Bartók some measure of financial security and provided him with a much-needed emotional boost. As well as performing new works dedicated to him, Szigeti also championed the music of other contemporary composers, notably Sergei Prokofiev and Igor Stravinsky. He was among the first violinists to make Prokofiev's First Violin Concerto a standard part of his repertoire, and frequently performed and recorded works of Stravinsky (including the Duo Concertante, recorded with the composer at the piano in 1945.) The Berg Violin Concerto he even recorded twice, under the baton of Dimitri Mitropoulos. Most famously, Szigeti recorded the Bloch concerto, a premier recording made in 1939 with the Orchestre de la Société des Concerts du Conservatoire conducted by Charles Munch (originally released on Columbia LP and reissued on Membran CD). ^ "Legendary Violinists. Joseph Szigeti". thirteen.org. ^ a b Schubart, Mark: "Szigeti Writes His Biography", The New York Times, 1947-03-09. ^ "Royal Concertgebouw Orchestra, 9 November 1939: Bloch". Andante.com. Archived from the original on 7 December 2006. Retrieved 2007-06-25. Szigeti on the Violin: Improvisations on a Violinist's Themes (N.Y., 1969). "Joseph Szigeti." Baker's Biographical Dictionary of Musicians, Centennial Edition. Nicolas Slonimsky, Editor Emeritus. Schirmer, 2001.